As thousands of commuters, visitors and residents look for travel alternatives Wednesday, many are taking a moment to poke fun at the unprecedented daylong shutdown of the Metrorail system. The transit system shut down at midnight for a system-wide safety inspection of its third-rail power cables. It will reopen at 5 a.m. Thursday unless inspectors find an immediate threat to passenger safety, which Metro General Manager Paul Wiedefeld said was unlikely. News of the closure exploded on social media, with some on Twitter dubbing the situation "#Metromageddon" or "#Metropocalypse." Many others — including a few transit agencies — found humor in the unprecedented closure. "So... we're open tomorrow if anyone needs a ride," the DC Streetcar account shared on Twitter Tuesday. 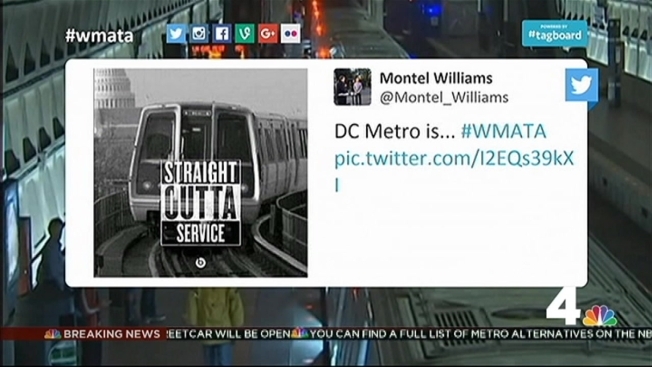 Former talk show host Montel Williams shared a picture of a Metro train with the words "Straight outta service." Metro will reopen as planned at 5 a.m. Thursday, officials announced Wednesday evening.